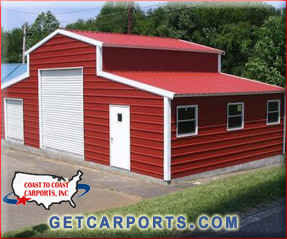 Coast to Coast continues to offer some of the lowest metal barn prices on the market. Our structures are high quality’ robust’ and built to last. They can be constructed to withstand numerous weather conditions’ as well as hold up to every day wear and tear. All of this is made available to you by Coast to Coast’ while still maintaining some of the industry’s lowest metal barn prices. Using steel to construct a barn is a practice that has really caught on in recent years. In fact’ using metal in buildings of all types is a fast growing trend. Whether it be a storage unit’ shed’ carport’ workshop’ office building’ or garage; metal buildings are perfect for commercial and personal uses of all types. A decade ago’ barns were generally constructed out of wood and nails. In recent times however’ it has come to light that steel is a far better choice; as it is much more versatile’ durable’ available’ and affordable. Plus’ metal barns can be erected and put to use in no time at all. This provides added cost savings’ as we all know that time is money. Our metal barns for sale are built to last a lifetime, termite and weather proof! Coast to Coast has currently carries a wide selection of pre-fabricated metal barns. We have numerous styles’ sizes’ and layouts available; certain to meet the requirements of customers of all types. We have do-it-yourself designs’ as well as more complicated structures available. We can even design and construct a custom made building to better suit your needs. No matter what your choice’ when you do business with us’ you are always provided with the option to have our assembly crews setup your metal building on your behalf. And as always’ setup and delivery are always free. Steel barns come with many added benefits. They are easily modifiable structures’ making them one of the most flexible and long-lasting building solutions. As your home or business continues to grow’ our structures are designed to grow right along with you. From adding additional interior walls’ to increasing building height’ to expanding the width; modifications are made easy with a metal barn from Coast to Coast. And with such low metal barn prices’ there has never been a better time than now to purchase your new structure.